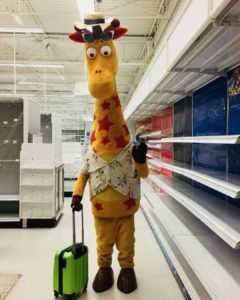 This week, the image of mascot Geoffrey the Giraffe, leaving an empty Toys R Us with his rollaboard suitcase, went viral. The picture of Geoffrey was taken by Toys R Us employee Rene Johnpiere and posted on Facebook, according to an article from CBS News. I share many memes and witicisms on social media, but this picture of a sad Geoffrey brought reactions and comments from people that rarely interact with my posts. Why did this visual have such an impact? Two words: Raw Emotion. The company was founded in 1948, adopting the Toys R Us name in 1959. This means, for almost everyone alive today, they either shopped there as a kid, took their own kids to the store, or both. When you’re a child, life is innocent. It’s unlikely the evils of the world have jaded you yet, and you are able to experience pure, unadulterated joy. That’s what a trip to Toys R Us meant. You may have gone home with a big ticket item like a bike or a Nintendo. Maybe it was just a four dollar Teenage Mutant Ninja Turtle action figure. Perhaps Mom and Dad brought you to the store to reward you for good grades, or rather to cheer you up after learning a hard life lesson. Either way, you’d be hard pressed to find an American that doesn’t have an emotional connection to Toys R Us. It’s that very emotion that makes this picture so poignant. Geoffrey’s sunglasses are pulled up, he looks melancholy, and the once bursting-at-the-seams-with-toys shelves are barren. It may remind some of their own days of unemployment, or even their parents’ struggles. There’s cognitive dissonance here; an image we’ve all associated with such unadulterated joy has become a sad reminder of a cruel world. I’ve shown the picture to several people in person, and it doesn’t even elicit the typical “meme chuckle.” Everyone just reacts…sadly. And the juxtaposition of these happy and sad emotions really makes an impact. Geoffrey the Giraffe made an emotional connection to kids and parents of all ages. That’s why he was a resounding marketing success that spanned generations. It’s powerful when these kids, many with childen of their own, are getting legitimately upset by this picture. Emotional connections make powerful content. When I was 25, my college roommate and best friend, Bill Leaf, was killed by a drunk driver. I was filling in as the night DJ that week in Vermont, and I didn’t know what to do. So I talked about my grief on the air. People with similar stories called. 12 years later, people occassionally still mention my show from that night. Emotional connections don’t have to be sad, though. I proposed to my now-wife in September 2016, and we were married in July of 2017. I lived out that whole process daily on the air with my Detroit listeners. The shared experience of planning and having a wedding served as a way for me to create a connection with listeners here. Think about that emotional connection when you are creating content for your podcast, radio show, blog, or any other entity. Are you sharing common, relatable experience to elicit joy in your audience? Or, maybe you’re sharing something powerful that triggers sadness? Now, I’m not suggesting you manipulate the emotions of your audience for personal gain. People have great “BS” detectors and will see right through that. But I am suggesting, if you can find a way to connect to your audience on an emotional level, that you’re content will resonate that much more. How are you connecting to your audience on an emotional level? People make decisions based on emotion, then find facts to justify those decisions later. This is also true of what content they consume. Let them decide on yours by tapping into their emotions. Great pic, great article. !!!! !